I was going to write a more complete recap of this situation later, but we’re already seeing some comments about it. Trailing 38-31, the Broncos (2-0) reached the 1 but on third-and-goal, Cutler reared back to throw and the ball slipped out of his hands, bounced off the grass and into linebacker Tim Dobbins’ hands. But referee Ed Hochuli blew his whistle, apparently ruling it an incomplete pass. After a review, Hochuli said that the Broncos would keep the ball because his whistle had blown the play dead. 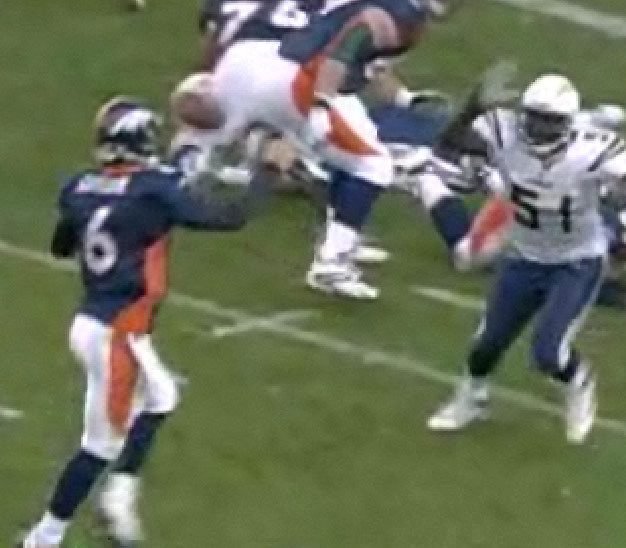 The Broncos got the ball at the 10-yard line, where it had hit the grass out of Cutler’s hands. I’m kind of torn on this. Hochuli obviously blew the call, but did all he could to make it right. Once he had blown the whistle, there was nothing he could do. Of course, he never should have blown the whistle. The difference last week in the Washington-BYU game was that the refs had time to discuss it, and still blew the call. Of course, that game would have only tied it, whereas this call certainly lost the game for the Chargers. should hold his head high.